A new kitten on the blog! We are an author and a photographer, with a shared passion for the Maltese Islands. We moved here in 2012, and soon observed that the Islands were also home to an abundance of cats! No matter where we went, we would meet cats bathing in the sun, or lying leisurely in shady corners. Even though their permanent residence is in the streets, it doesn't go unnoticed that the strays are well fed and in top condition, gleaming with glossy fur and bright eyes. It is rare to see one that is unkept and sickly. Investigating even further, we noted ‘feeding stations’ where plates and bowls with food and water had been left for the feral cats. We were as curios as a cat. Who was sustaining the purry felines? In search of the answer, in October 2015 we embarked on an enlightening quest through the Maltese Islands, meeting persons from both genders and walks of life who, with a huge amount of self sacrifice, have not only committed themselves to the welfare of their feline fellow residents, but in doing so have silently helped the Maltese environment. And we are still travelling! Our journey will lead to a book dedicated to these devoted men and women. Introducing the reader to some of the individual caregivers, delve into their history and the reason for their chosen vocation. 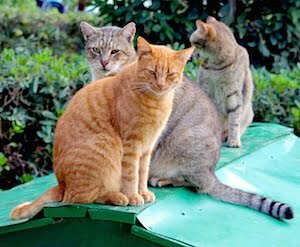 In the mean time, this blog shall serve as a permanent platform for stories and news about cats in Malta and around the Globe.